Philadelphia is hosting the 2018 ANA World’s Fair of Money and with it comes a whole host of new issues from many of the world’s premiere coin producers. 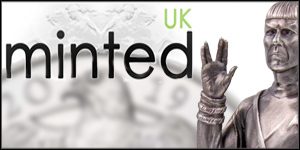 Chief amongst those will be CIT Coin Invest, the Liechtenstein based collector favourite issuer of some of the world’s most impressive modern numismatics. We’ve already covered their excellent La Catrina Skull and Mongolian Lunar ranges after being given early access, but now we can see what else is coming and it’s far more than we were expecting. We figured there would be new Magnificent Life and Evolution of Life coins, along with perhaps a few small issues, but we’ve been very impressed by the number and quality of new coins appearing, giving the ANA Show its due as the second biggest in the annual coin show calendar. Check them out below in brief form, we’ll take a closer look at some of them next week when the show is finished. All comments welcome, of course. 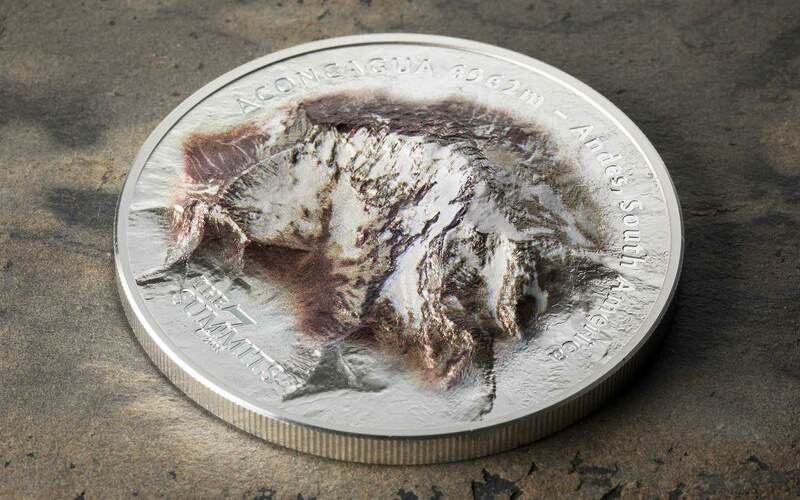 What a fantastic way to kick off our look at CIT’s new range than with this ambitious new meteorite coin. CIT have been making meteorite coins longer and more consistently than just about anyone else and this is their fourteenth. Despite the full-size diameter of 38.61 mm, and the complex and extreme strike, this one remains formed in just half an ounce of silver. If that isn’t a demonstration of smartminting in extremis, we don’t know what could possibly convince you. 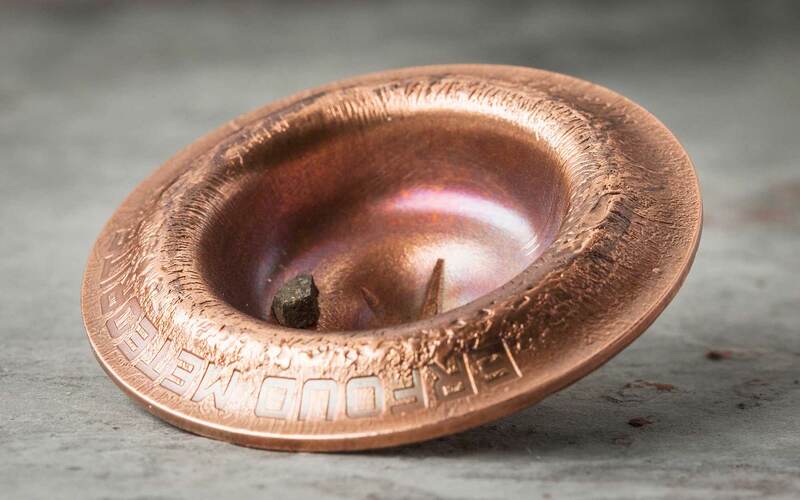 Issued for the Cook Islands, the coin is copper-plated with some partial colouring, and incorporates a piece of moon meteorite. It’s packaged in a round tin. The fourth in one of our favourite series, Evolution of Life heads away from Terra Firma and into the sky with a cool look at a Pterosaur – one of the flying reptiles that in their largest forms, exceeded the size of a light aircraft. The one depicted here has obviously seen better days and won’t be soaring anywhere again, but looks to be a beautifully detailed addition to the series. Antique-finished with rose-gilded highlights, this one ounce coin is issued for Mongolia. It comes in a themed wooden box and, like all of the coins here, with a certificate of authenticity. A small minigoldvariant will also be available. 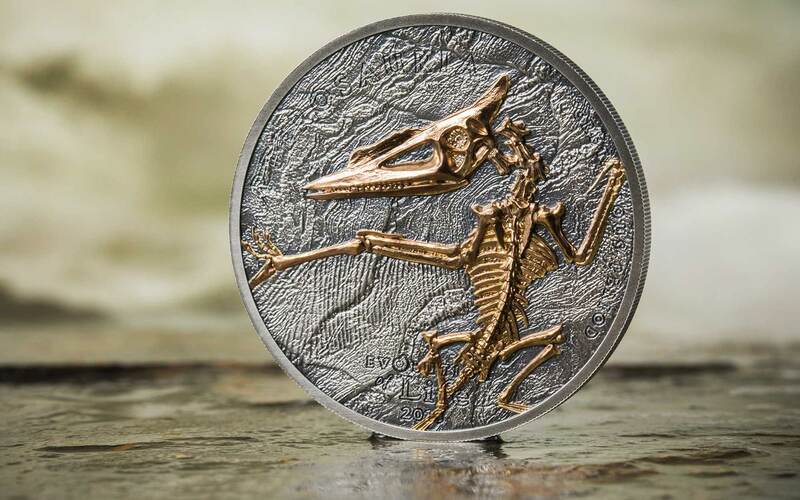 The latest dimensional coin and one that follows issues like the Giant Panda and the Penguin, the Gecko is a cool looking piece, although one that obviously pushes the many collectors ideas of what constitutes a coin. No such problems here – we think there’s plenty of room in the market for designs that push boundaries. 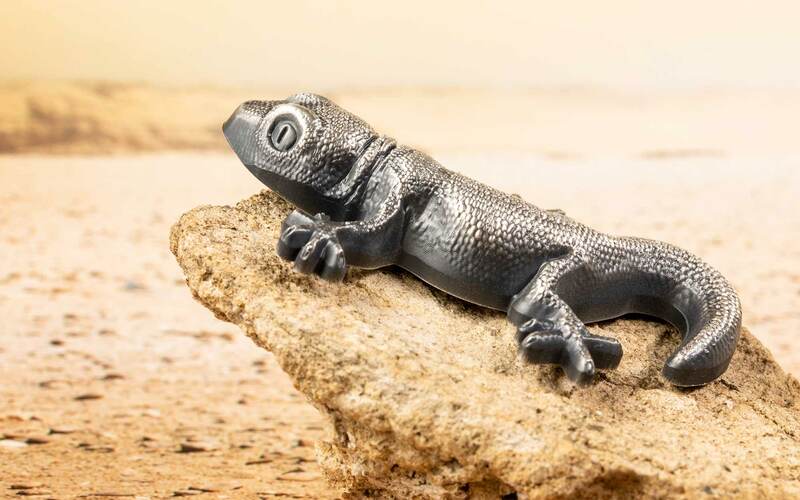 Again, smartminting is used to full effect and just one-ounce of silver has been used to form this 50 mm long gecko. Supplied in a box. Straight on to another dimensional issue and yet another example of how adept smartminting is with turning small amounts of silver into intricate shapes. 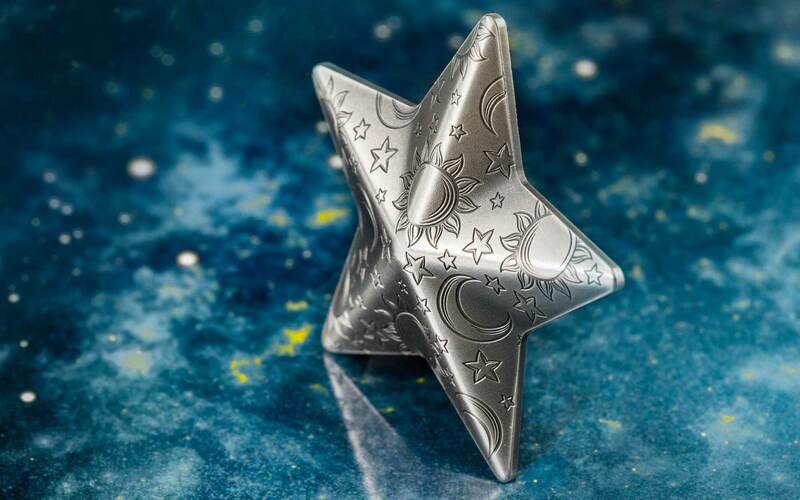 A finely decorated five-pointed, it’s designed to sit alonside CIT’s earlier Lullaby coin and follows similar design principles to their Silver Fortune and Silver Heart coins. Formed in an ounce of silver and 33 mm across, it has a mintage of 2,500. Another collector favourite series, Magnificent Life is also on its fourth issue and follows the Peacock, Wasp Spider and Cobra. 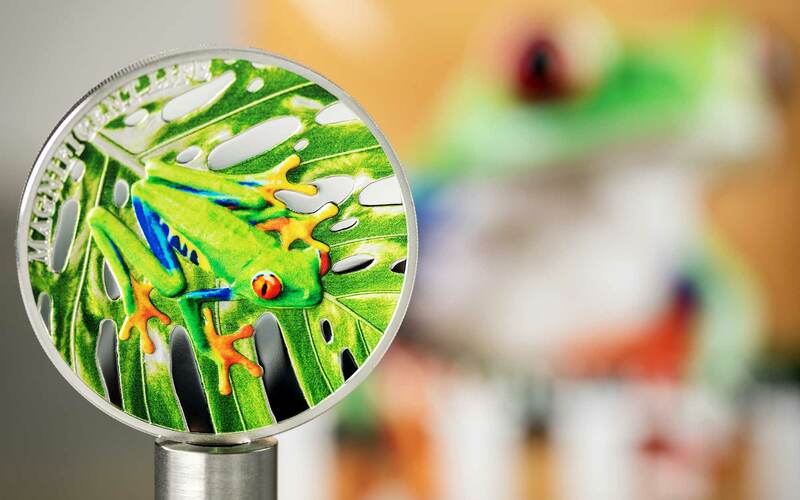 This time around, it’s the turn of the amphibians with this brightly coloured depiction of the gorgeous tree frog. 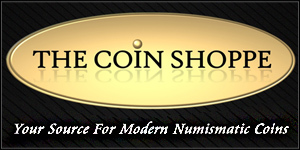 These coins have concave reverse faces, and that’s the case here. A real return to form after a subdued cobra issue last year. Also one-ounce of silver in weight, it has a 999 mintage and comes supplied in a themed box. 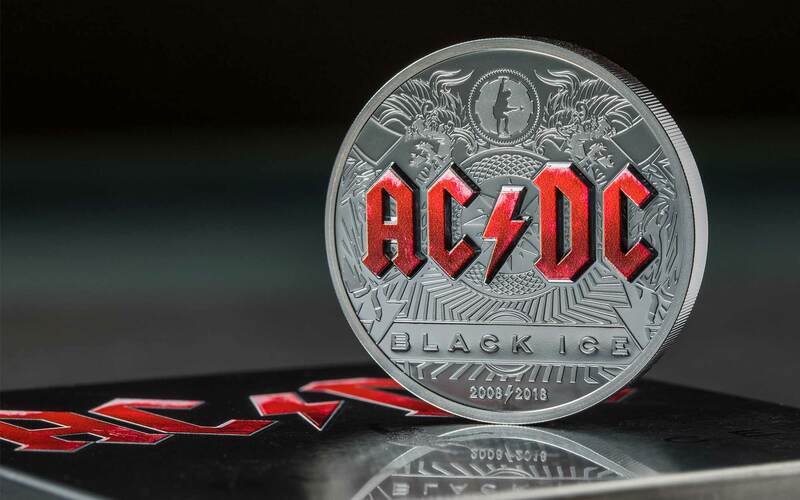 A new pair of coins celebrating the work of iconic band AC-DC. The one pictured above is a two-ounce, black proof silver coin that celebrates the ten-year anniversary of their famous album, Black Ice. Another, less striking coin commemorates the bands first album, High Voltage and comes in at just half an ounce in comparison. The larger coin has a mintage of 999 and the smaller one tops out at 5,000 pieces. We’re moving upmarket next with the third of CIT’s 7 Summits five-ounce silver coins. The highest mountain outside of the Himalayas, Aconcagua resides in South America and is beautifully modelled on this large, 65 mm diameter coin. With a mintage of 777 pieces, each one comes in a floating frame for easy display. Issued for the Cook Islands, this looks to be a fine addition to this intriguing set. One of the most recognisable symbols in the world, the crucifix appears on surprisingly few modern numismatics. No mistaking CIT’s addition to the genre, however. 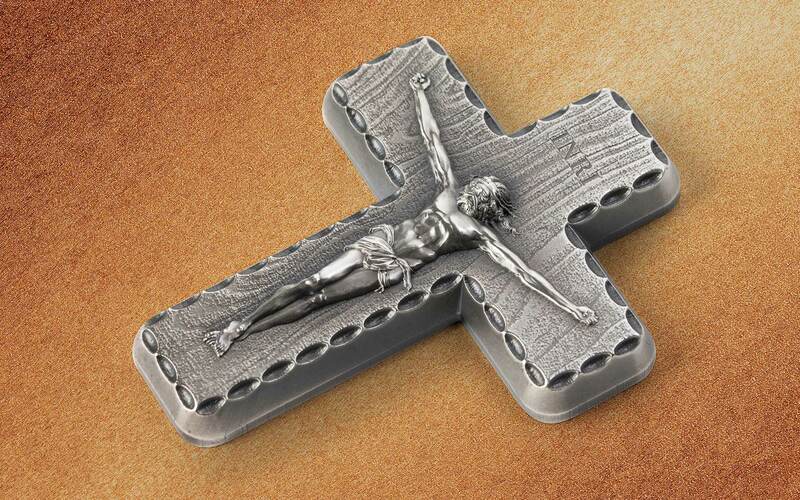 A good sized 57 mm tall, this two-ounce silver issue has a detailed depiction of Christ on one side and a complete inscription of the Lords Prayer on the obverse. We can imagine this will have huge appeal to Christians. It comes in a gloss black box and has a pretty large mintage of 5,000 given the specification. A shaped minigold version is also on offer and stretches its 0.5 grams of gold out to almost 14 mm. Obviously, the figure and inscription is missing, but it joins CIT’s extensive minigold range of unusually shaped coins. The mintage on the gold is 15,000. 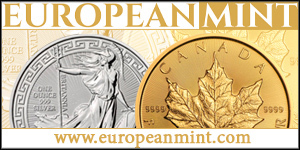 Usually more the preserve of the big national mints, high-end versions of bullion coins are a rarity from CIT. 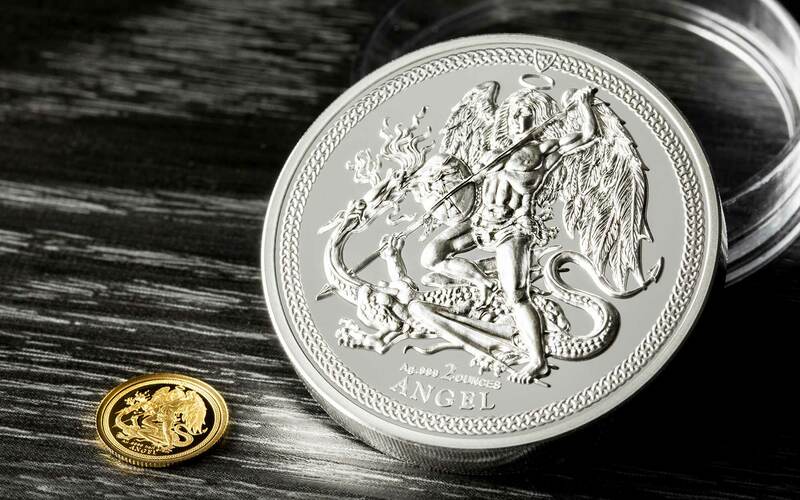 WIth their contract to help produce coins for the Isle of Man, that little British islands famous Angel bullion coin has now recieved the two-ounce, proof, high-relief treatment. Pretty much the definitive variant of this long-running bullion coin, it has a mintage of 999 pieces. 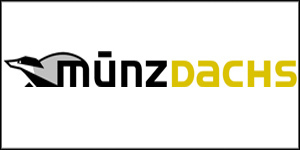 A small proof minigold version of less than half a gram in weight is also up for grabs with the usual mintage of 15,000 pieces. 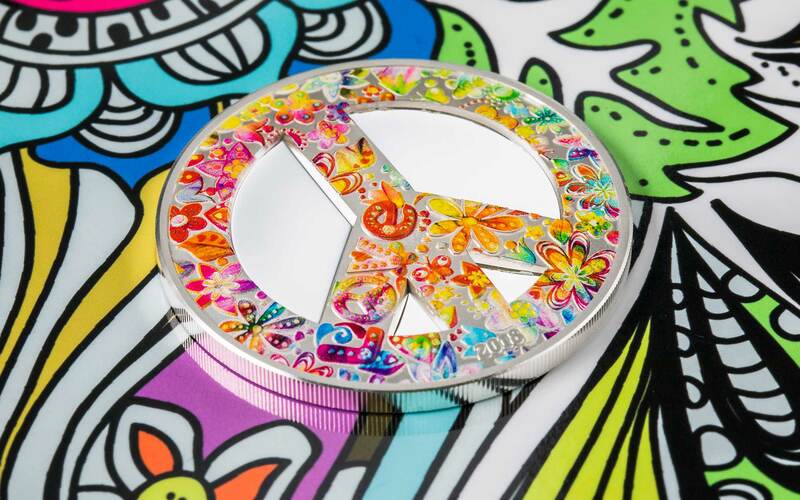 One for the hippies or those that look back fondly on the sixties, it’s been over half a decade since the fabled Summer of Love and CIT have taken the peace symbol, dialled the decoration up to eleven and struck it on a one-ounce silver coin. A similarly psychadelic tin holds the coin and it has a mintage of 1968. 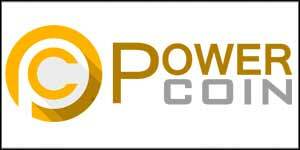 No surprisesthat a minigold variant with a 15k mintage will also be offered. This one is quite unusual and mixes the natural with the supernatural. 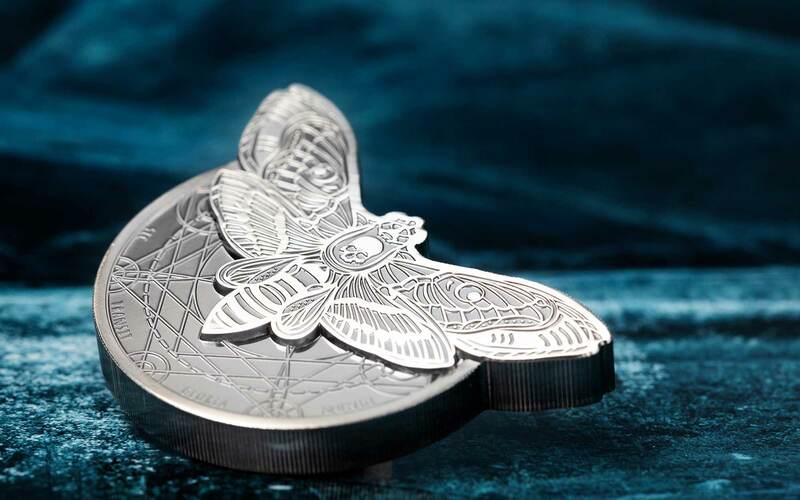 Seemingly sprouting from the top of a normal coin, the moth is finished with a new polishing technique called lapping. 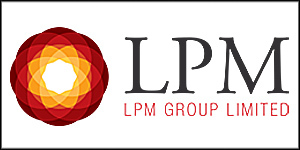 This creates a flat, reflective surface that contrasts with the glossy black proof finish of the rest of the design. Another two-ouncer, the Death’s Head Hawkmoth is issued for Tanzania – a break from CIT’s more common use of Palau and Cook Islands. The mintage is 999. Yet again, a minigoldvariant with a 15,000 mintage has been produced, although it has a more traditional round shape than the silver. 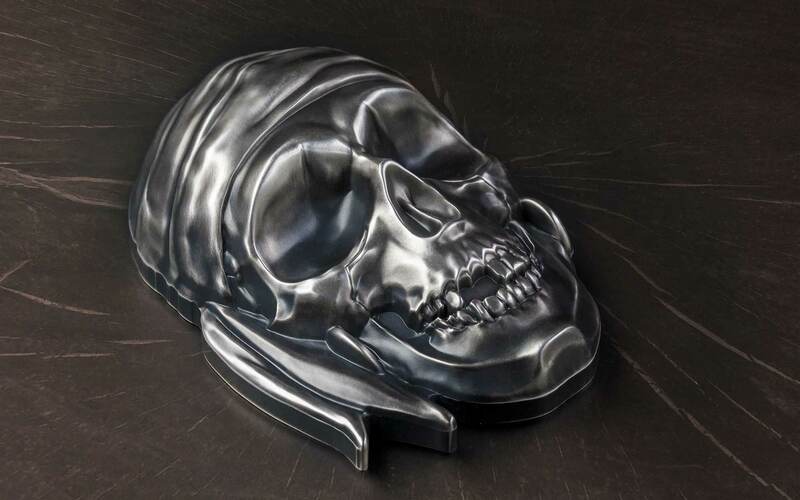 CIT’s impressive skull series has already seen its all new 2018 design with the La Catrina skull, but here we’re revisiting the 2017 design with another giant version, just as there was last year of the 2016 coin. Weighing a chunky half-kilo, this has a 555 mintage and looks to be quite exceptionally well struck. 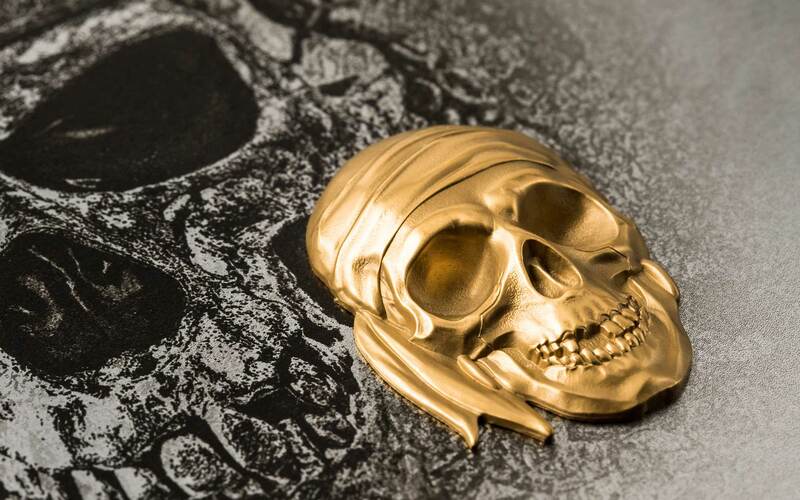 In a rare excursion for CIT, they’re issuing a one-ounce gold version of the Pirate Skull design. Don’t expect this one to be cheap and it has a mintage of 300 pieces. Any collector that follows CIT issues will know about the Ounce of Luck. 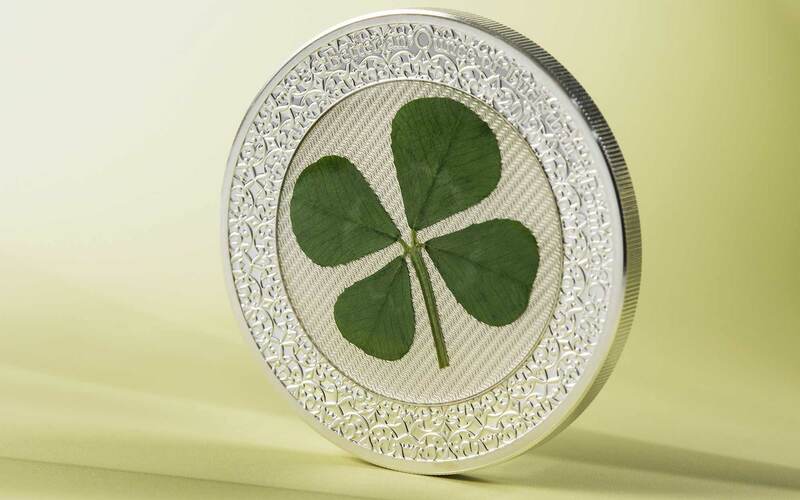 Issued every year since 2011, it incorporates a four-leaved clover in a coin that is either an opunceof silver or a gram of gold in weight. The border seems exceptionally well detailed this year. Just 2,019 of each variant will be produced. The Pterosaur is just class and the most striking of the series to date. 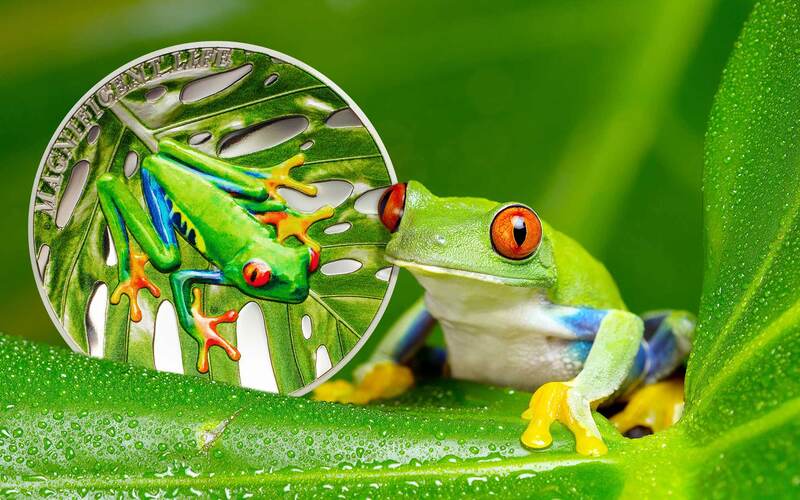 The Evolution of life Tree Frog is bursting with colour, having the set i know you have to see them in hand to appreciate just how nice they are so im excited to see it up close. Would love to see the sunset moth on a future release but the frog is, ahmm well magnificent. The Deaths Head Hawkmoth is interesting and i love how its been photographed.